Don’t scab! 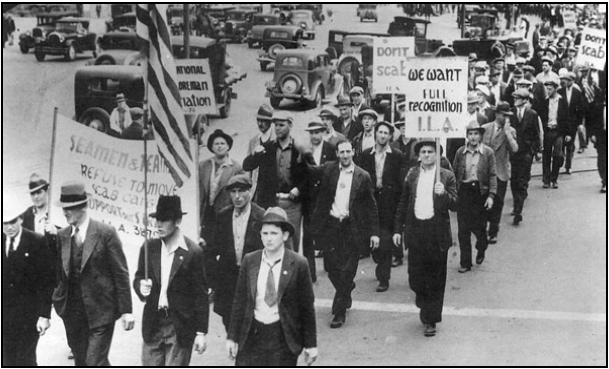 A 1934 San Francisco picket line. There is a widespread rejection of DC in favour of ‘pluralist’ parties at the moment. All types of liberal anti-Trotskyists wish to be free of the discipline of the class struggle under the guise of escaping from ‘sectarianism’ and ‘dogmatism’. From In Defence of Trotskyism No 3. 1. The revolutionary party must champion all aspects of oppression in all classes and not just fight the trade union struggle – “the model for the revolutionary is the tribune of the people and not the trade union branch secretary” Lenin says. 2. DC is the particular organisational and political form that a revolutionary socialist party must adopt. 3. The revolutionary party must give active leadership to the class, be the best fighters for all reforms and so gain the ear of the vanguard for revolutionary solutions. Trotsky makes a sell-criticism in 1939 of his position before the Revolution on this question and Lenin’s general orientation to the revolutionary party. He says that in his opposition to Lenin he ‘had not freed himself at that period especially in the organisational sphere from the traits of a petty bourgeois revolutionist’. By this he meant that he did not understand how the working class and the revolutionary party had to wage the class struggle. There is a widespread rejection of DC in favour of ‘pluralist’ parties at the moment. All types of liberal anti-Trotskyists wish to be free of the discipline of the class struggle under the guise of escaping from ‘sectarianism’ and ‘dogmatism’. Without a revolutionary party based on DC as its organisational norm it is impossible to educate the membership and the broader vanguard in revolutionary theory. We cannot learn from struggle unless we unite in struggle against the common enemy. Therefore DC is necessary because of the peculiar form of oppression endured by the working class and their fight-back against this. When they engage in serious strike struggles they are obliged to mount picket lines. Whatever the law says they know that to win in the first place they must prevent the more backward of their ranks breaking the strike. If it is a serious struggle like the dockers battle in Australia (1998 Maritime Union strike) all talk of democracy is forgotten and the battle commences in earnest. Workers’ democracy denies democracy to capitalists to hire and fire at will and to other workers to scab. It requires the fullest discussions before votes are taken and these should be taken at meetings where workers feel their collective strength rather than in individual postal ballots where workers are isolated and subject to media and domestic pressures. Once a majority decides some action then the organisation must enforce compliance from opponents within its own ranks by whatever means available to it. So workers’ democracy is for struggle – workers’ organisations sorting out what they need to do in full discussion enforcing their decisions by whatever means necessary and at their disposal. Significantly the Tory directed most of their anti-union legislation against these norms of workers’ democracy. Even majority rule in a formal sense cannot wait because struggle can produce that majority in the correct circumstances. We saw this elementary class instinct in operation when the Cortonwood miners picketed out the rest of the Yorkshire coalfield and began the great miners’ strike of 1984-85. Lenin argued against the Mensheviks that already in the factory we see the principles of DC in the forms of struggle workers’ organisations are obliged to engage in, irrespective of their mis-education about the sacrosanct nature of bourgeois democracy. This is workers’ democracy in action. When a revolutionary, centrist or even reformist group explains the logic of their actions class consciousness can be advanced. The revolutionary party can win recruits. As the highest form of workers’ organisation the revolutionary party must both reflect and develop the elements of workers’ democracy into a conscious practice and organisational norm. Thus the theory of DC was extracted from and developed out of the practice of the working class in struggle. The democracy is for deciding how to struggle the centralism is in ensuring we strike together so we can learn from our victories and defeats. In deciding how to handle serious political and ideological differences in the group it is surely reasonable to demand that these are first raised internally on the highest body available to the member or members. The right to form tendencies must be facilitated by the constitution and must be seen as a normal part of internal life. It must be positively encouraged when substantial differences appear because these generally reflect real problems within the class. Only by serious debate and struggle can theoretical advances be made. The more this is encouraged the fewer factions will be formed by disaffected members – and so there will be less danger of splits – and fewer members will be lost through demoralisation caused by ideological frustration and confusion that is merely repressed . Readers will recognise the lack of these norms in the internal regimes of various groupings – the Healyite WRP, the SWP, Militant, the old Morenoite LIT and some of its successors, the Lambertists, etc. The USFI has better internal democracy than most but operates internationally, and sometimes nationally, on a federalist basis to enable them to tail end various left reformist nationalist and Stalinist forces. However there must be a level of ideological cohesion in a group. Public differences should he normally expressed, and should not be regarded as political treachery – as long as the overall thrust and direction of the group’s policy is defended. Where to draw this line should be determined by the political climate, the degree of political freedom in the country, the internal state of the group and the dictates of the class struggle. But the Party Congress and the democratically elected central leadership must be empowered to draw that line. If a central leadership lacks the respect of the membership then it can only establish that in struggle, not by repression. Otherwise we will train rabbits and not revolutionaries, as so many others have done up to now. When the workers have spread their organisational norms and methods of struggle throughout society in the formation of pre-revolutionary soviets or workers’ councils the dictatorship of the workers has begun to challenge the dictatorship of the bourgeoisie. If the revolutionary party gains ideological control over the soviets and the revolution is successful the worker’s state imposes its workers’ dictatorship – the dictatorship of the proletariat – over the capitalists. l. The need for the UF and transitional politics. In seeking to develop these the realisation developed this was the application of the dialectic and a new approach to the UF was needed. 2. The need to study and develop the dialectic itself to defend and develop dialectical and historical materialism against Mach and Bogdanov. Lenin began this work as early as 1906. Lenin’s aspiration in 1902 was to recruit the entire vanguard and his schema equated the revolutionary leadership with the vanguard and denied the existence of other forces and the necessity to relate to them in struggle—Kautsky’s ‘party of the whole class’ approach. The Bolsheviks were devastated by the fact that Trotsky and the Mensheviks had led much of the failed revolution of 1905 and they were marginalised. They had to reassess their attitude to the masses, and other groups claiming to be revolutionary and to re-arm themselves theoretically for 1917. Lenin even railed against soviets for a few weeks in 1905, unable to see the content behind the form. DC now became much more like the ‘seething internal democracy’ Trotsky said the Bolsheviks had in The Revolution Betrayed. The principle of DC as outlined in the TP now began to operate: ‘Without inner democracy – no revolutionary education. Without discipline – no revolutionary action. The inner structure of the Fourth international is based on the principle of DC: full freedom in discussion, complete unity in action.’ Did Lenin and the Bolsheviks become soft on Trotsky and the Mensheviks after 1905? No. They realised their tactics were proved to be hopelessly inflexible. The consciousness of the working class was not simply either bourgeois ideology or social democratic Marxism as represented by themselves. There were many intermediate stages and different levels. It could veer sharply to the left but not knock on their door. They had to fight for it, and therefore for the leadership of the class, in a different way. Yes but what is the nature and extent of this ‘inherent revolutionary capacity ‘? Yes the first quote is from Volume 10, written during the 1905 revolution. The second quote, from several years after the event (in Volume 16 of the Collected Works, 1910) describes the class conscious worker who has come to see the need for revolution (how? without political intervention’?) but not one who is a Marxist, not a scientific socialist. What the 1905 revolution showed was that in 1905 at any rate, the working class might be ‘instinctively, spontaneously Social-Democratic’ but many opted for the wrong Social Democrats, the Mensheviks and Trotsky! Moreover the phrase ‘the Social- Democracy’ implies the Mensheviks also had to be credited with developing the revolutionary consciousness of the masses. But this did not mean that Lenin was therefore about to concede leadership of the revolution to them. He understood that a socialist revolution cannot succeed without the construction of a revolutionary Marxist vanguard party to lead it. And this party must have learned scientific socialism as first elaborated by Marx and Engels and as developed by various others, chief among whom nowadays must be counted Lenin and Trotsky. This was surely contained within Lenin’s 1902 formulation along with the confusion. It permeates all his writings before and after and we must defend that whilst rejecting his 1902 bias which amounted to a measure of party sectarian voluntarism, a la Kautsky. Political theory like this cannot evolve ‘spontaneously’. Marxism cannot spontaneously arise in the working class no more than a building worker could enter a hospital operating theatre and suddenly discover he or she could perform intricate brain surgery. This is almost unbelievably wrong. It is pure metaphysical reductionalism, simplistic mechanical materialism with no bow in the direction of the dialectic at all. Some theory must guide all practice. Practice is primary but the practice of the working class that is not guided by some form of socialist theory does not lead to any significant increase in class consciousness. Almost all the practice of the working class is guided by bourgeois ideology and theory – as applied by trade union bureaucrats – and does not alter consciousness to any lasting extent. By socialism Lenin here obviously means revolutionary socialism as reformism had not yet separated itself out as a definite trend in the Second International, or more pertinently he had not recognised that process in train in the German SDP; Rosa Luxembourg was far more developed on this question than Lenin at the time. The struggles of the working class does create better conditions for socialists (and by socialists here we mean all who are fighting for the class independence of the working class, reformist or revolutionary) to raise the consciousness of the working class. It also creates the conditions for revolutionaries to recruit from the vanguard and raise the revolutionary consciousness of the entire workforce. Kent NUM President Malcolm Pitt (1944-2010) wrote the story of the part played by the Kent Miners in the 1972 miners’ strike in The World On Our Backs – a book which was widely read by Kent miners and remains today a work of quality on the miner’s life and struggles. Let us take the example of the miners’ strike of 1984-85 to illustrate the point. In the course of that struggle the Yorkshire pit villages were under a virtual state of siege as nationally co-ordinated police squads tried to stop the flying pickets. We began to hear miners express sympathy for the plight of the besieged nationalist community in the North of Ireland almost for the first time. Remember that in the north of England there was much sympathy for the Loyalist cause historically. Many trade unions, under the influence of the labour aristocracy, supported the Tory Party. They shifted to the Labour party in the first decades of the century, bringing all their anti-Irish chauvinism with them. Scargill himself had a bad position on Ireland at the time. Then came the Battle of Orgrieve. The parallels were there for all to see. The nationalists and the miners were in a common battle against the state. Huge donations began to flow to the miners from Ireland, particularly from the northern nationalists. The Kilburn branch of the old WRP, on the suggestion of comrades in Willesden, proposed to hold a public meeting on the theme, ‘Orgrieve, Belfast, one struggle one fight’. The reaction from the WRP leadership was astounding. 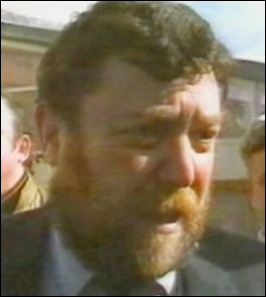 I found out later that the decision was already taken not to criticise Scargill’s leadership of the strike, on Gerry Healy’s insistence, against opposition from the News Line editorial board. Sheila Torrance came to a twenty two strong branch meeting in Kilburn to denounce this initiative as a provocation and to enforce acceptance of the line to withdraw from the Miners’ Support Groups. Apparently ‘ultra-left’ criticisms of Scargill and proposals for initiating sympathetic industrial action was damaging to the NUM. The Branch capitulated to the pressure, despite strong opposition from me and Charlie Walsh. An even more disgraceful incident happened. A public meeting was called in Camden by a Black community group. It had Black, NUM, Sinn Fein and PLO speakers. The News Line ran a story condemning the meeting, saying it was an attempt by police agents to tar the NUM as terrorists. This resulted in an attack by black youth on a Young Socialist disco in East London which put me and another comrade from Willesden in hospital. The NUM speaker was Malcolm Pitt, who was a CPGB supporter and led the Kent NUM. The struggle itself had made the miners and their communities open to political advances in all areas as shown by the struggles of the Women against Pit Closures, the Lesbian and Gay support groups etc. The Irish and Black support was reciprocated. But it needed a real revolutionary party to concretise those advances in terms at new cadre for the revolution. This largely did not happen, few miners actually joined far left groups but there was a huge influx into the Labour Party. 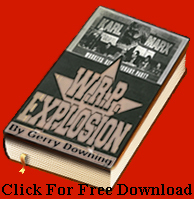 Here the obvious opportunity to qualitatively develop class consciousness on vital issues for the British working class – racism and Ireland – was criminally rejected by the WRP and many other left groups to maintain unprincipled relations with Arthur Scargill. Their ‘united front’ with the NUM was unprincipled and one sided, it amounted to an opportunist rotten bloc with Scargill and the opportunity to win miners to revolutionary politics was lost. This was a major factor in the break-up of the WRP and other left groups after the defeat of the strike. However it would be wrong to conclude that all is now lost from that strike. The heightened class consciousness still lives on even in the Labour party and in the trade unions. However inadequate this answer is nevertheless it is far superior to the LRP quote above in 1985 which could equally apply to beavers, ants and bees, who should ruling the planet now if they were correct! When the Bolsheviks were exposed as so tactically inept in 1905 they began to seek the roots of the problem. They had to look into their own soul. It was not against the Mensheviks that they conducted the struggle to defend and develop Marxist philosophy but chiefly within their own ranks. Between 1906 and 1910 Lenin waged a major battle in defence of dialectical and historical materialism. He wrote Materialism and Empirio Criticism in 1908 and conducted the struggle against Bogdanov, basically in defence of Engels’ elaboration of the dialectic . His Ten questions to a lecturer of 1908, for example, directs this defence from abroad against Bogdanov’s followers within the party . He consulted or studied over two hundred publications in preparation of this major work, visiting libraries in Geneva, Paris and London. He spent a whole month studying at the British Library because it contained works not to be had elsewhere. In 1914 to 1916 he conducted his major study of Hegel and the history of philosophy . This prepared him for the sharp turns and political struggles against the Bolshevik Central Committee who were succumbing to national chauvinism ‘in defence of the revolution’ when he arrived back from Switzerland in the sealed train in April 1917. Though he stressed that philosophy should never be a split question – and thus saved the revolutionary soul of the likes of Lunacharsky – nonetheless the 1908 struggle educated a new layer of Bolsheviks who became the front line leaders of the revolution in 1917  . 14 For a comprehensive debunking of this misuse see What is to be Done? in historical context by Tim Peach, Communist League, Australia jointly published by the WRP (Workers Press) and the CI, in Tasks of the Fourth International March 1987. The CL was a split from the SLL who supported David North’s Workers League (US). The article is a powerful rebuttal of despotic sectarian misuse of Lenin’s book ripped out of its historical context. 15 We define a tendency as a party grouping that aims to change this or that aspect of the party’s line or programme and a faction as a grouping that aims to replace the existing leadership. 16 Founding document of the Trotskyist Fourth international in 1938. 17 Though, in fact, Trotsky’s theory of permanent revolution was correct against both Mensheviks and Bolsheviks; the coming revolution had to be a socialist one. The confusion on this question undoubtedly contributed to the marginalisation of the Bolsheviks in 1905. It did not affect the Mensheviks so much because, contradictorily, of their opportunism. 19 Ibid. p. 8. Lenin CW Vol. 16, p. 32. 20. Ibid. p. 8. Lenin CW Vol. 16, p. 302. 22 Lenin, What is to be Done? p. 42 footnote. 23. How prophetic that was given North’s present rejection of trade unions, the right to self-determination of oppressed nations, etc. In fact everything, but ‘the (his) revolutionary party. 25 Lenin CW vol. 14. 26 Lenin CW vol. 14 p. 15. 27 Lenin CW vol. 38. 28 A conference of the editorial board of Proletary, the Bolshevik newspaper of the time, adopted a statement by Lenin that ‘to present differences on philosophy as factional was racially wrong’ (Lenin, CW Vol. 14 p. 391). 29 A V Lunacharsky (1875- 1933) took his idealism as far as ‘mentally projecting for himself a god’ wrote Lenin but he (Lunacharsky) re-joined the Bolsheviks in 1917 and became the first Soviet Commissar for Education (1917-29).